The new Scan to Print workflow enhancements provide a clear benefit for our sellers to save time and money. ShipStation, the leading web-based e-commerce shipping solution, today announced "Scan to Print", new and more efficient workflow features that allow users to more easily scan packing slip barcodes to find and print shipping labels in a single click. This updated workflow feature allows e-commerce merchants to quickly weigh packages after confirming products are in stock, then purchase and print shipping labels. Retailers can now save money on wasted labels caused by learning that items were out of stock too late in their process, or inaccurate weight estimations. 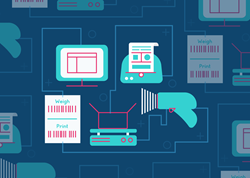 Scan to Print also decreases a retailer's reliance on keyboards and mice to process orders. Merchants can now use a barcode scanner to automatically create shipping labels instead of having to click through multiple screens, and weight from a connected scale can be automatically applied - saving time and increasing efficiency. "Our development team is always looking for ways to improve the e-commerce shipping experience," says Robert Gilbreath, ShipStation Vice President of Marketing and Partnerships. "The new Scan to Print workflow enhancements provide a clear benefit for our sellers to save time and money."